Why use Breeze as a project management software? Breeze is built from real-world experience, it's small and personal, and adapts to your needs. Fast based projects, agile and lean principles, and improvements are at the core of Breeze. It's designed to be easy to use by everyone, not only by engineers but anybody who wants to know what's going on in the project. A simple agile board with all your tasks, stories, issues and bugs. Prioritize and plan work to get the big picture. Collaborate with your engineering team and discuss every detail. Invite anybody to add feedback and insights. Know how long it takes to complete tasks and where's room for improvement. See your lead and cycle times. Breeze lets you track bugs, plan work, gather feedback, launch products and more. Track and manage every detail of your project with Kanban boards, lead and cycles times, and cumulative flow diagrams. Breeze shows you what's being worked on, who's working on what, where things are in the workflow and how much time it took. 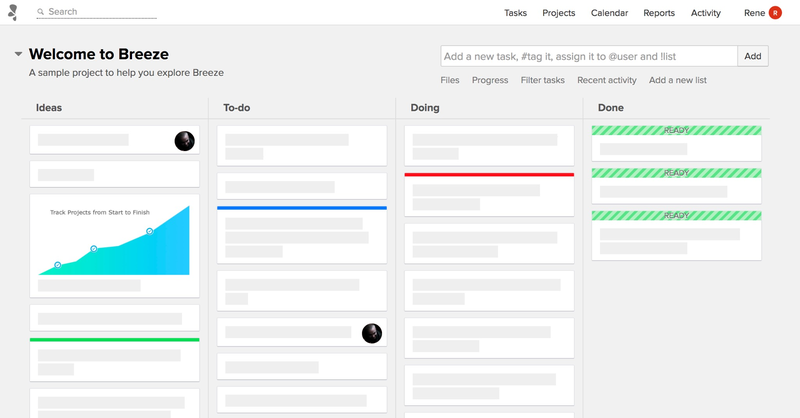 Create project boards and divide them into task lists and swimlanes. Organize your projects with tasks and to-dos. Assign tasks and set priorities. Discuss tasks, features, and bugs to keep everyone on the same page. Use Slack, HipChat or Flowdock integration to have a real-time chat. Set milestones and due dates for releases in the calendar. Use custom fields to track everything - software versions, web browsers, milestones, releases, or anything you can imagine. Lead and cycle times, cumulative flow diagrams, task and project reports show you all the details. Provide high-level overview to management using Gantt charts. Use the integration with Ganttile to manage Gantt charts. Add comments, complete and move tasks, and track time directly from Git commit messages. Breeze has integrations with Github, Bitbucket, Beanstalk, GitLab.